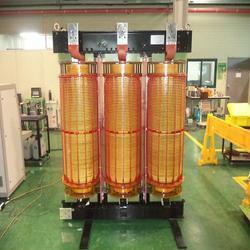 We are the manufacturer & supplier of Dry Type Transformer. With the help of our experienced team of professionals, we are manufacturing a gamut of dry type transformer that are available in various sizes and specifications. Sturdily constructed using the best quality components, these transformers are also custom made as per the specifications provided by the clients. We are offering a range of Dry Type Transformers that are designed and manufactured using the latest technology. Offered in different specifications and models, these dry type transformer are used for various industrial and commercial applications. They can be used in practically any indoor application or in any outdoor application with a weather-proof enclosure. To meet the specific requirements of our clients, we also offer customization facility based on the size and design of the transformers. Dry-type transformers require minimum maintenance and provide long years of trouble-free service. Fire proof vaults and toxic gas venting systems are not required. With high impulse strength insulation systems, they will coordinate with all electrical system designs. Conservatively designed, the sound level is very low, making the Spang transformer desirable for indoor applications in commercial buildings. Secondary Voltage 433 to 6600 Volts. With the help of our experienced team of professionals, we are manufacturing a gamut of vpi type transformer that are available in various sizes and specifications. Sturdily constructed using the best quality components, these transformers are also custom made as per the specifications provided by the clients. Dry transformers are very compact in sizes and hence suitable for basement installations in high rise buildings etc. Dry transformers are available with low losses giving savings over long service periods. Periodical vacuum cleaning of winding surface is the only maintenance. 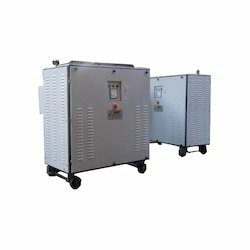 The capacity range of these iron core transformer is up to 2000 KVA with primary Voltage up to 11 KV class & secondary Voltage between 433 to 6600 Volts.